Endless Possibilities: The organizational wire racks are great entryway and garage organizers, you can hang your dog leashes, coats, umbrellas, hats and keys or use it in your garage to store your athletic equipment and gear. Disorganized? Tired of being messy and clumsy? We’ve got a solution for you, the kitchen organizer racks are simplistic for storing all the things sitting on your counter top, dining or bar table, keep your kitchen streamlined to work more productively with your cooking supplies, not around it. 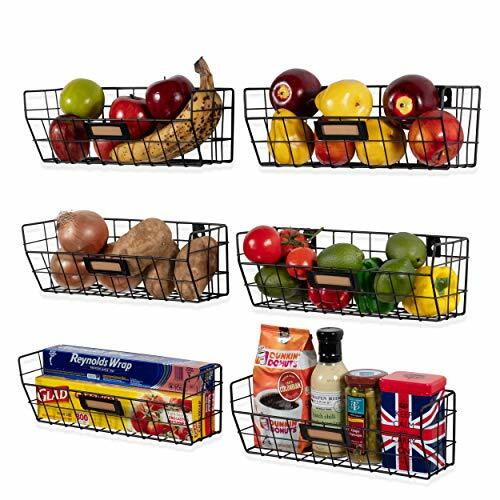 The Kitchen Organizer Wire Racks Will Help You To: Organize and tidy up your pantry food, spices and produce. Keep your counter top, cabinets and drawers free of clutter, keep the things you need close at hand to work with your supplies not around it. Organize and space saver It helped me organize my kitchen and wine bottles in a small space.